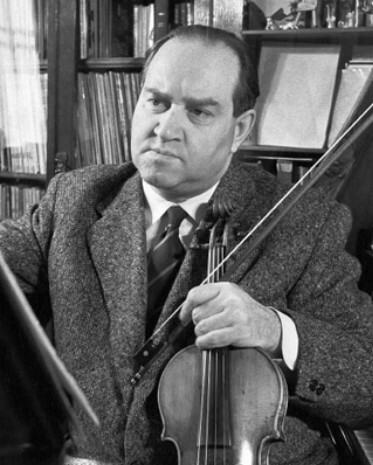 Oistrakh, David [Ойстрах, Давид; Ojstrax], b 30 September 1908 in Odesa, d 24 October 1974 in Amsterdam, Holland (buried in Moscow). Virtuoso violinist and teacher of Jewish origin. He graduated from the Odesa Institute of Music (later Odesa Conservatory) in 1926 in the class of Petro Stoliarsky. He went on to win numerous international music competitions and gain world renown as a talented musician. Besides his appearances in Paris, London, and the United States, he performed in Kyiv, Kharkiv, Odesa, Dnipropetrovsk, Kherson, Mykolaiv, Kirovohrad, and other cities of Ukraine, often as a soloist in symphonic concerts. From 1934 he taught at the Moscow Conservatory. His Ukrainian pupils included Oleh Krysa, Olha Parkhomenko, and Yurii Mazurkevych.